Cats like to climb, and your brand new curtains or drapes look like the excellent climbing feature to your cat. The end result is a happy cat that sits perched on the very top of your curtains, and you get left with a shredded and mangled mess that’s almost impossible to save. Since this is natural for a cat to climb, how to stop your cat from climbing curtains? Luckily for you and your curtains, there are several techniques and tips you can use to try and curb this destructive behavior. Not only will your cat thank you, but your curtains will too! No matter what type of cat you have, they have a hardwired need to climb up vertical spaces because this gives them an excellent view of their surroundings, they feel safer, and it’s fun for them. All cats climb at one point or another, and curtains or drapery is something easy and accessible to them in your home. If your cat isn’t feeling well or simply wants to get away from anyone, they’ll most likely seek out a higher place to hide. This is technically destructive behavior because you don’t want your cat do to do it, but can you really blame them for doing something that comes naturally to them? There are several things that you can to do stop your cat from climbing the curtains and teach them that this isn’t acceptable behavior you want them to indulge in. We’ve listed several tips and tricks to help you, and you may end up using a few until you find one that works for your cat. If you don’t have the time to teach your cat not to climb, you can simply remove the temptation altogether and switch your curtains to vertical blinds. They perform the same function as your curtains do, but they’re almost impossible for your cat to climb, shred-proof, and they allow your cat to peek outside. You can find these types of blinds for virtually any window size, and you can open them quickly and easily during the day to let the sun pour into your home. You cat will move on and find something else to climb. Most cats simply want a place to perch that’s slightly off of the floor where they can look out the window and watch everything that goes on outside. You can save your blinds by installing a perch or two that attaches to your window sill, and this is a relatively easy process. This way, you’ll be able to open your blinds during the day to expose the perch, and your cat will naturally gravitate to this area instead of scaling your curtains. You can get these window perches in different sizes and styles, and some are even easy to remove during the night. Since you can’t be there all of the time to startle your cat when they start their climb, you can install an alarm to do the job for you. You can clip a small motion detector alarm or a door alarm to your curtain that’ll automatically go off each time your cat makes the curtain move. It should only take them a few times of setting off the alarm for them to connect the dots and realize that the alarm will go off every time they climb the curtains. They’ll avoid this noise, and they’ll eventually stop going around your curtains. Maybe your cat isn’t feeling the best, and they could be anxious, they may climb to get away from anyone until they start to feel better. You’ll need to schedule an appointment with your veterinarian and voice your concerns because they can test for various illnesses and come up with a treatment plan. Depending on what your veterinarian finds, treating it may stop the curtain climbing altogether. Not only will your cat feel better, but your curtains won’t be in danger of claw marks. 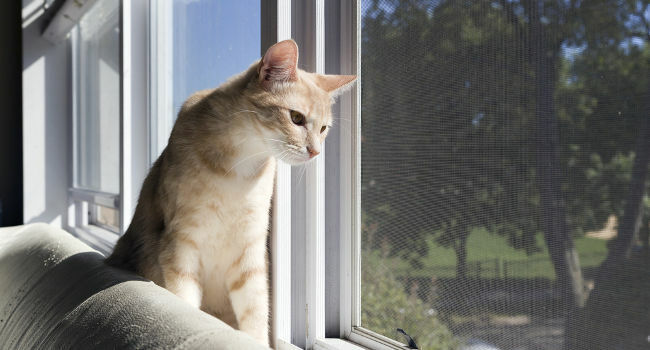 Your cat doesn’t like the feel of aluminum foil or double-sided tape, and these are both excellent ways to deter your cat from tearing up your curtains. You can apply aluminum foil to the bottom of the curtains to deter your cat from trying to climb from the floor up. Another way to stop this behavior is to put strips of double-sided tape in your curtains where your cat normally climbs. They don’t like the sticky sensation on their feet, and they’ll work to avoid it. Deterrents are a great way to encourage your cat to stay off of your curtains, and cats don’t like citrus scents like orange or lemon. You can get orange or lemon essential oil and mix a few drops in eight ounces of water to create a deterrent that smells good to you. You can spritz around and on your curtains with this deterrent every day or so, and the smell should encourage your cat to stay away because it’s too strong for your cat’s sensitive nose. They also don’t like the smell of eucalyptus. Tension rods will hold your curtains in place until your cat puts their weight on them to try and climb it, and then the rods will let go, and the curtains will fall to the ground. Your cat will fall back to the floor with them before they have time to do damage to your curtains. After a few times, your cat should start to leave the curtains alone, and you can switch back to your normal curtain rods. However, this won’t work if your cat likes to play in the pile of curtains that ends up on the floor. If everything else fails and you’re not sure what else to do, offer your cat a vertical alternative like a kitty tower that has higher perches that they can climb. If you don’t have room for a large tower, you can look at vertical towers that attach to your walls or ceiling. When your cat starts to climb the curtains, take them off the curtains and place them on their new tower. Most cats start to climb it and explore right away, and they’ll return to this place once they realize that it helps them feel safer and more secure when they’re up high. It is possible to keep your curtains and train your cat not to climb them. This is slightly more labor intensive, but it’s possible if you can dedicate the time to do it right. Many cats climb because they’re bored and they don’t have access to mentally stimulating toys within easy reach. You can provide your cat with toys like balls, paper bags, boxes, hanging toys, and more that they can chase around. They can be both homemade and store-bought toys. Each time your cat chooses to play with their toys instead of climb and shred your curtains, you can reinforce this good behavior by giving them a treat or a small reward. Eventually, they’ll learn that leaving the curtains alone leads to good things. Any high perches in your home will naturally draw your cat to them, and they’ll want to relax up there. 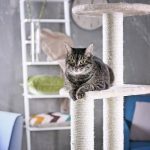 You can get a cat tower or install higher perches around your home, and you can tempt your cat there by placing treats or by using a small amount of catnip spray. Now that you know how to stop your cat from climbing curtains and several things you can do to curtail this behavior, you can use them on your own cat to save your curtains and keep your cat happy. It may take a few days or weeks for your cat to understand what you’re trying to teach them, but it’s completely possible.